The rosebowl, spittoon, and vase were all made from the same molds. Green has not been reported in the rosebowl but there are two spittoons known in green. The first to be sold, with a small chip, was in 1995 when it brought $7,000. In 1996, another that was cracked and bruised sold for $3,000. In 1998, the first one sold again, but with the small chip doctored, it brought only $1,700. In 2006, the cracked green example sold for $2,000. Vases vary in height from 9 to 11 inches, but a few range up to 13 inches. Millersburg also made a pattern without the swirls called Hobnail. 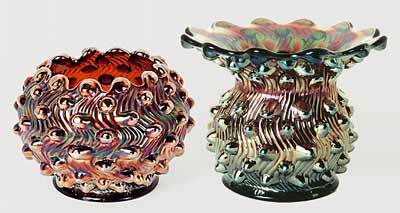 Information on knobby vases here.